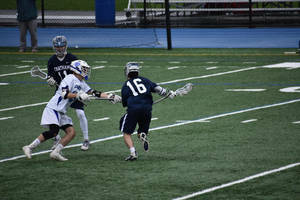 CHATHAM, NJ - The Chatham boys lacrosse team went into its game against Summit on Saturday at Cougar Field as one of the best teams in the state. And after the 7-5 loss to undefeated Summit, the Cougars are still one of the best teams in New Jersey. They just don't rank among the elite teams - at least not yet. The road to a state title for Chatham almost always travels through Summit, so the Cougars got a primer on where they need to be by the end of the season. Chatham (5-2), which has dropped two straight, nearly matched the defensive prowess of the Hilltoppers in this one. After spotting Summit (6-0) a 3-0 lead in the first quarter, Chatham went 31 straight minutes without allowing a goal, carving a slim 4-3 edge on Patrick Conte's goal (see video below) off an inside spin more with 7:12 to play in the third period. But Summit's renowned defense clamped down on Chatham from that point on, scoring four straight goals in the fourth quarter to earn the win. "We needed to make a play," Chatham coach Tony Calandra said. "We did hold them scoreless for a half hour. The difference was that we were winning faceoffs. When you're winning faceoffs, you can possess the ball a little bit and take some good shots. We kind of did everything we wanted to do. If we could have just gotten a couple more goals and put pressure on them." The second quarter belonged to Chatham, with Danny Mahoney igniting a three-goal run with his goal in the first minute (see below) from 12 yards up top. Less than three minutes later, Aidan Decker received a pass from Grant Webster and put his horizontal shot into the net (see below) to cut the deficit for Chatham to 3-2. Chatham pulled even at 3-3 when Mason Agostinelli cut to the net and put away Grant's pass from behind with 2:56 left before the break (see the video below). Chatham nearly took the lead into the break, but Conte's goal off a pass from Decker was ruled "no goal" by the referee who said he entered the crease before the goal (see the video below). Conte did score in the third quarter for a 4-3 Chatham edge before Summit got a goal from John Fischetti with 8:41 left to tie it for Summit before Jackson Tyler connected to give the Hilltoppers the lead for good. Michael Bonomo scored two straight goals, the second with 50 seconds showing for a 7-4 Summit advantage. Chatham senior Luke Agnew picked up a ground ball and that led to Webster's goal off a pass from Conte with 27.1 ticks left (see below). "I thought we played really well," Calandra said. "I thought we played hard. We did everything we wanted to do. When we held them scoreless (in the third), we only scored one. "I thought the effort was great. We played tenaciously on defense. I thought we played really well on ground balls and we cleared the ball extremely well." Chatham next travels to play at No. 1-ranked Delbarton on Wednesday.